We’re always keen to hotfoot it towards any new Playtech slots to be released. So when we heard about the Space Invaders slot, we just had to take a look. We’re old enough (yes, we admit it) to remember when Space Invaders was a big leap forward in the fledgling gaming industry. How will it fare being updated in the 21st century? 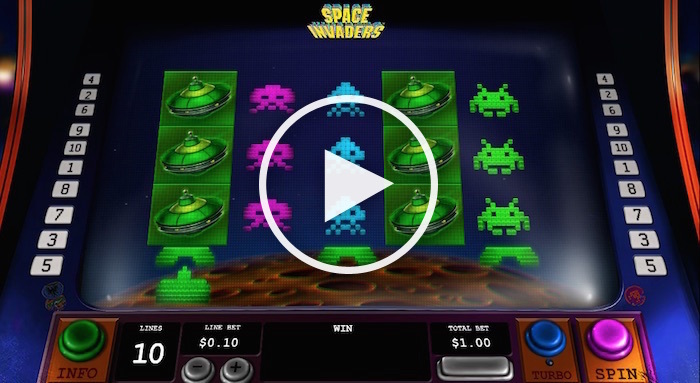 The Space Invaders slot from Playtech is a 5 x 3 online slot featuring 10 paylines – rather less than many other slots have, but still enough to provide a good chance of winning something with each spin. The original game dates back to the Seventies (we’re giving away clues to our age there…). This version brings the classic look of the original – it even gives you the appearance of an arcade machine – and yet it has been fully updated for the modern internet era. At first glance we were very impressed, but did the game live up to this first impression? 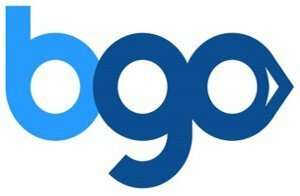 Based on a ‘both ways wins’ platform, which makes it easier to scoop wins in some cases. But it does have other things to offer as well. It starts with an arcade machine to play the game on. Playtech has done a nice job of replicating the real-life machine purely by ‘tilting’ the reels away from you. It’s a simple but effective ruse. The controls are designed to look like buttons, but they’re all easy to use and make sense of. The big green button takes you to the pay table, while anything you win is displayed on the reels and at the bottom-centre position of the screen. There are seven basic symbols involved in Playtech Space Invaders – three low-payers, three higher-payers and one – the planet – that pays out significantly more than the rest. Three of the five payout table pages are devoted to the special features we’ll look at in a moment. The final page reveals the fact that the game doesn’t just pay from left to right – it also pays out if you get combinations running from the right of the screen to the left. So let’s move on to the special features you can expect from this slot. So the game does have wilds included, but not in the same sense as normal wilds. Additionally, there are no scatters to be found, nor will you get any free spins (other than the respin feature, of course). However, with that said, and despite the fact, there is no real bonus feature, you do have two excellent features that are likely to show up quite often when you play the Space Invaders online slot game. The first of these is the Invaders Turn Wild feature. As you spin the reels, you’ll notice the presence of a cannon underneath them. This moves with each spin. If it stops underneath reel two or four, it will transform any low-value symbols on the relevant reel into wilds if doing so will bring you a prize. Wilds will double the value of any prize won in this way, and they have the power to replace everything else as well. The other main feature is called the UFO Wild feature. As you play the game, you’ll probably spot a red UFO occasionally whizzing across the top of the reels. It doesn’t always stop, but the idea is to hope it stops above the same reel the cannon stops beneath. If they line up in this way once the reels stop spinning, the cannon will automatically fire a shot to take out the UFO. In doing so, you get the benefit of a free respin of the reels. What’s more, the respin adds a number of wilds to the reels, which makes it possible to snag several prizes once the reels stop their respin. You can get up to nine wilds added in this way, but the more you get, the more you are likely to win as the combinations start adding up. This is probably the best feature of the game and the one that is most likely to bring up some significantly bigger wins. This game allows you to adjust the line bet from a mere penny all the way up to £20. That makes the minimum bet just 10p per spin, while the highest one would be £200. The highest prize given for a standard symbol is 150 coins when you get five planets on one of the 10 paylines. However, it’s perfectly possible to get a much bigger payout if you get several wilds added to the screen during a spin, so watch out for this feature. The return-to-player is rather good too, we thought – coming in at 96.16% over time. 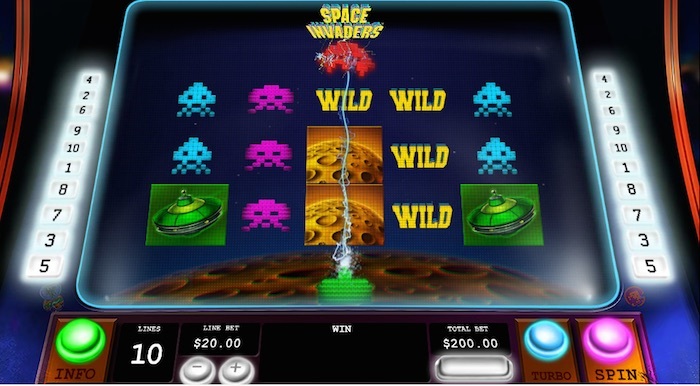 You’ll find the Space Invaders slot at most popular Playtech slot sites for UK players. If you’re old enough to remember the original, the online slot version of Space Invaders will bring back memories and satisfy your nostalgia. However, we have a feeling even new players will enjoy the various elements this game has to offer.